Four years ago Patron Spirits bought Ultimat Vodka. Initially introduced in 2008 (just before our current economic ups-and-downs) in Boston, San Francisco, Chicago, New Jersey and New York, it is currently available in all 50 U.S. States. Yet last year just 23,000 cases were sold. Ouch!!! Considering the volume of vodka sold by others (think multi-million cases here), Patrón Spirits has decided to launch a new 8 million dollar marketing campaign for their new vodka, using the tag line “Find Balance, Find Ultimat”. All the resulting publicity will highlight achieving a needed balance between work and fun. 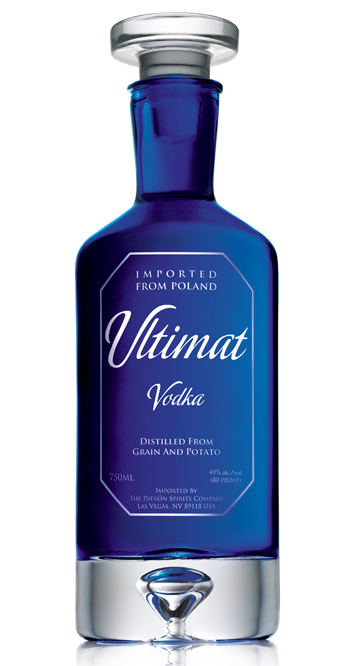 The “Balance” theme is perfect for Ultimat as it is the only vodka currently crafted that balances a blend of wheat, rye and potato that creates a singularly unique beverage. Extensions of the theme also include “Live Ultimately” and “Good, Better, Ultimat”. Even the bottle captures the theme as a small glass bubble is suspended in the base of the bottle like an expectation of the enjoyment to come once open and shared. Given the marketing success of Patrón Tequila (currently ranked as the number one ultra-premium tequila in the world), Ultimat is sure to soon be, well, an ultimat- ly popular vodka in a world seeking balance (and comfort) in these troubled times. While the marketing of Ultimat Vodka is focused on “balance”, Marriott Hotels & Resorts are launching a US $6 million global advertising campaign emphasizing that guests will “Experience More at Marriott”. Highlighting the theme of “more” are six custom illustrations created by the world famous artist Kareem Iliva (who has created art for the likes of Chanel No. 5 and Champagne Perrier-Jouet, to name only a few). The eye-catching art will be featured in 26 gateway airports and feature watercolor silhouettes on background images of Marriott hotels in London, Beijing, Aruba and Pune, India. Posted on October 4, 2011 by Ana Kinkaid and filed under Alcohol, Champagne, Design, Hotel Marketing, Hotels, Reviews, Spirits, Trends and tagged Chanel No. 5 Kareen Iliva Marriott Hotels Patron Spirits Patron Tequila Perrier-Jouet Champagne Ultimat Vodka Vodka Wheat Rye and Potato.